A quick and easy Rib-Eye Sandwich to make every steak lover drool. This Rib-Eye Steak Sandwich can be cooked to anyone’s perspective of a “perfectly cooked steak”. It is great for a fast and tasty meal that makes you look like a restaurant chef. Preheat the grill to 425 F with island grill stone for 15-20 minutes. Place the focaccia bread slices on the island grill stone. Once done, remove them off the heat. Season the steaks with coarsely ground black pepper and salt. Cook the onions over the Island GrillStone until they turn soft. When the onion are cooked half way through place the steaks on the grill stone. Cook for a couple of minutes and flip the steaks. Put the onions over the steaks while cooking, as shown in the video. 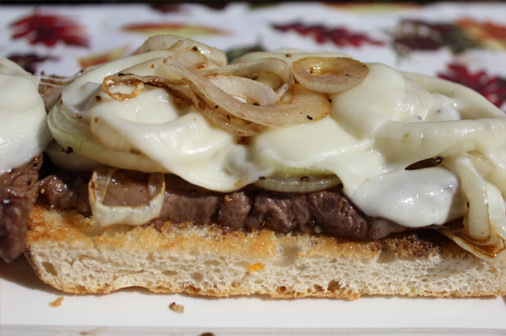 Place cheese slices on the top of layer of onions (2 slices per steak). Grill until cheese melts and place over the roasted bread slices.